I originally said I was going to write about the Sky Wheel, but I had it confused with the other Cedar Point ferris wheel. I don’t remember the Sky Wheel at all. Moving on. 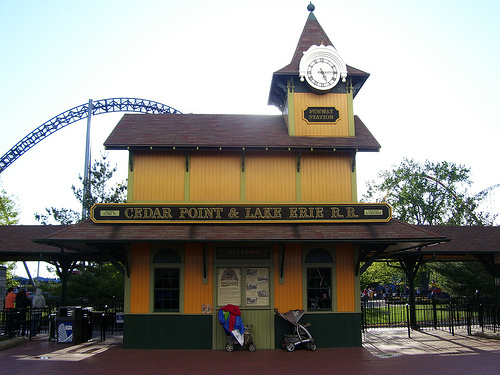 In 1963 the Cedar Point and Lake Erie Railroad was opened. The first half of the Railroad would take you from the main midway to Frontierland. Then you could get back on and ride from Frontierland to the starting station. If I remember way back this ride had animatronics on both halves of the ride. In more recent years they only exist sparingly on the second half of the journey. I think my favorite animatronic was the burning house. It featured fire fighters and a woman leaning out the window. It was setup so it looked like the fire fighters would catch her. I don’t remember on which half of the railroad this was on. As teenagers we loved to do the royal wave as we drove past crowds at the train crossings. I always wanted to jump off the train at one of the crossings, but I never did. The train was not necessarily the fastest way to get from the back to the front. If you got the station right when the train was there you might be able to get to the front of the park faster. Normally though you would wait 5-10 minutes for the train to arrive. This delay meant you could usually beat the train by walking. So, we normally rode the train because we wanted to go for a ride or we were walking by the station anyways and it was there. Also constructed in 1963 was the Mill Race. If you click on the picture below you can get an aerial view of the ride. PianoJohn posted this picture of the Mill Race in a forum post. 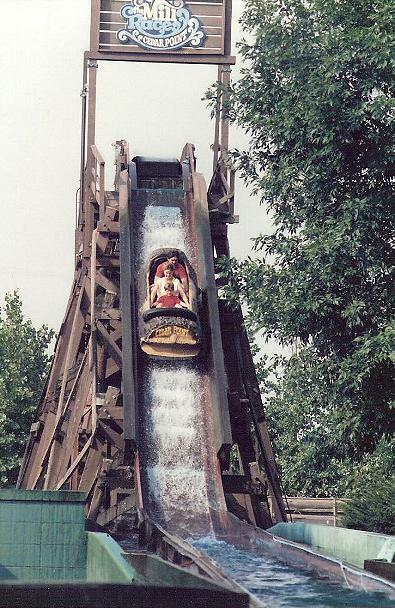 The Mill Race was a water flume ride that had dips and curves. It was kind of a water roller coaster. 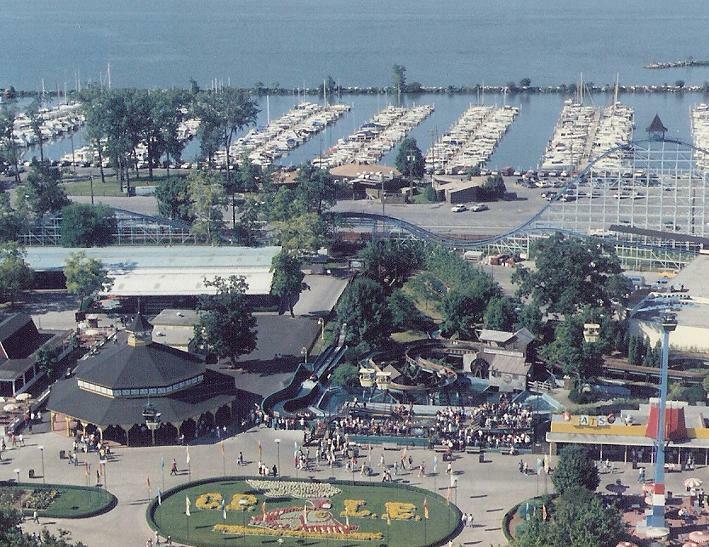 Later on Cedar Point would be a second one in Frontierland, White Water Landing. Unfortunately the Mill Race had its last year in 1993. It was removed to make way for the Raptor which debuted in 1994. The Mill Race was always one of the rides I needed to hit every year. Quite a few rides didn’t make it to that level. When I was going once a year there were a few “if I can get on due to line length rides”, but I never missed the Mill Race. The Mill Race was an older ride so the lines were not gigantic for it. It was a nice lazy ride where you didn’t get wet despite the water. You were more likely to get watching it than riding it. Here is another PianoJohn forum pictures of the Mill Race hill. I wonder how many injuries were caused by this ride? I remember always dipping my hand down to touch the water as a kid and teenager. I’m sure there were a few people with crushed hands that came from the ride. While I was hunting for pictures of the Mill Race I found lots of forum posts being nostalgic for it. I wouldn’t trade the Raptor for it, but they could have moved it somewhere else in the park. The footprint wasn’t so large that they couldn’t have placed it somewhere in Frontierland. I remember riding it 1993 and I wish I would have known that it was going to disappear. I may have cherished those memories just a bit more. Next time I am going to cover the Blue Streak.